Responses from the latest survey of around 3,000 businesses in the UK, using the Bank of England's Decision Maker Panel (Bank of England 2018),1 give us four key findings about the level and impact of Brexit uncertainty. In August 2016, in response to the question, ‘How much has the result of the EU-referendum impacted the level of uncertainty affecting your business?’, more than one-third of CEOs and CFOs cited Brexit as at least one of the top three current sources of uncertainty. 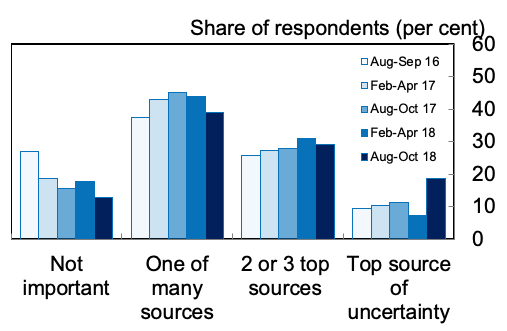 At the time, 10% said that Brexit was the most important factor and 25% said it was one of the top two or three sources of uncertainty (Figure 1). Successive waves of this question have shown that firms continue to place Brexit high on the list of sources of uncertainty. The share of firms responding that Brexit was one of the top drivers of uncertainty rose from 35% in August 2016 to almost 40% in August-October 2017, while the share of companies considering Brexit not important in the same period fell from 27% to 16%. The proportion of firms reporting uncertainty has remained high and has increased further – Brexit uncertainty has not been resolved. By August-October of this year, around the time of the Salzburg summit, around half of firms were reporting Brexit as a top-three source of uncertainty. Source: Authors' calculations based on data from Decision Maker Panel. 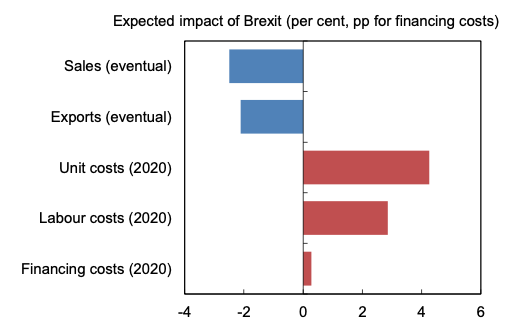 Figure 2 shows the effects that companies expect Brexit to have on their sales, exports and costs. Companies place more weight on Brexit reducing sales than on it increasing them. On average, businesses expected Brexit to eventually reduce their sales by around 2.5% (Figure 2). There was also a net negative expected effect on exports, while unit costs, labour costs and financing costs were expected to increase. To estimate the impact of Brexit uncertainty, we analysed the change in investment and employment for firms exposed to lower and higher levels of uncertainty. This difference-in-difference approach quantifies the effect that Brexit uncertainty has had on growth of investment and employment by firms. Our results show the uncertainty is associated with around 6 percentage points less investment. This reduction in investment appears to have happened mainly in the first year after the referendum, between July 2016 and June 2017. We also found that that there is 1.5 percentage points lower employment for these firms, with the effect being larger in the second year after Brexit (July 2017 and June 2018) than in the first. 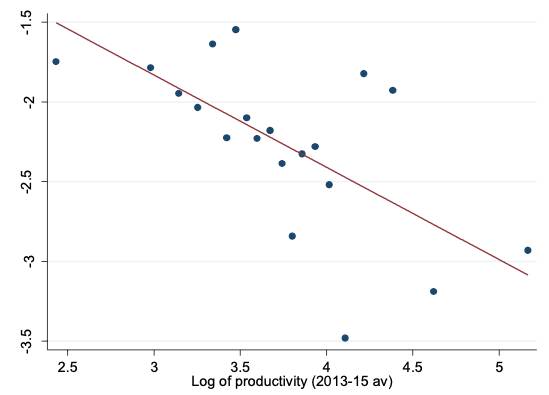 By a batting average effect, if Brexit reduces the sales of high-productivity firms by more than low-productivity firms that is likely to bring down average UK productivity. Our estimates suggest this implies about a 0.5 percentage point reduction in future productivity. Given that the UK economy has had very low productivity growth in the last decade (about 1% in the last few years), this effect is worth around half a year of productivity growth. In this column we estimate that Brexit uncertainty (so far) has reduced in investment by 6 percentage points and employment by 1.5 percentage points, and is likely to reduce future productivity in the UK by half of a percentage point. Authors’ note: Bloom and Mizen have received £683,636 in the form of an ESRC standard grant for “Measuring the Impact of Brexit on UK Investment, Productivity, Sales and Employment”. The funding will support an online survey and research into the impact of Brexit on the UK for three years, 1 Sept 2017 – 31 August 2020. The project is carried out with the collaboration of Bank of England, the Universities of Nottingham (UK) and Stanford (US). Bank of England (2018), "Agents’ summary of business conditions 2018 Q3 and results from the Decision Maker Panel", 13 September.